446 pages, 6 1/8 x 9 1/8"
Young S. Chae analyzes the puzzling association of the Son of David with Jesus' healing ministry in the First Gospel. 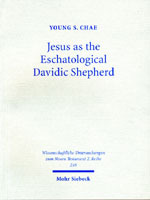 This, along with the Gospel's rich shepherd/sheep images and the theme of the restoration of the lost sheep of the house of Israel, finds a significant clue in the picture of Jesus as the eschatological Davidic Shepherd according to the pattern of the Davidic Shepherd tradition in the Old Testament and Second Temple Judaism. As Matthew communicates the identity and mission of Jesus, he is conversant with this tradition, particularly Ezekiel 34 and 37 as well as Micah 2-5 and Zechariah 9-14. The story of the First Gospel is the story of the return of YHWH as the eschatological Shepherd for the lost sheep of Israel and also that of the one Davidic Shepherd-Appointee as the eschatological Teacher-Prince in the midst of his one eschatological flock.